A siren blares, alerting the group of medics that they are needed immediately. They had been relaxing in the station’s lounge, as they often do between calls. But as dispatch radios in, the medics pull all stops and head to the ambulance bay, where they load into an ambulance and set off for their destination. 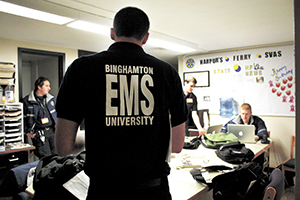 It’s a typical night for the crew of Harpur’s Ferry, Binghamton University’s student-operated emergency medical service, which operates year-round. Jill Shotwell, an undeclared freshman and Harpur’s Ferry trainee, went on her first call Friday night. At about 3 a.m., Harpur’s Ferry responded to a call in Susquehanna Community’s Brandywine parking lot. Though the details of the cases they handle are subject to privacy laws and can not be published, the medics were able to reflect on their experiences. ‘At first I was kind of nervous, but everyone was really nice and helpful. I was actually really impressed with ‘ how calm they were,’ Shotwell said, referring to the other medics. Most of Harpur’s Ferry workers are emergency medical technicians, though some have received a higher level of training to become paramedics, also known as Advanced Life Support (ALS). Training volunteers to respond to calls is a large part of Harpur’s Ferry. A standard Harpur’s Ferry crew consists of a crew chief, a driver and usually two attendants. The crew chief is in charge of each call and making the decisions regarding the patient, and the attendants are EMTs who perform tasks like taking vitals and gathering patient information. Crews are often accompanied by trainees called AFAECers, short for Advanced First Aid and Emergency Care. According to Nate Cisne, a Harpur’s Ferry paramedic and former BU student who now attends Cornell, EMTs have to train for 140 hours to receive their title, while the paramedic program requires 800 hours. Paramedics are allowed to perform more advanced procedures than EMTs. ‘I can start IVs, perform invasive procedures like intubation, administer medication and use electrical therapies,’ Cisne said. Paramedics are also allowed to administer narcotics, which, according to Cisne, Harpur’s Ferry just began using this past year. Harpur’s Ferry has to follow strict procedure regarding narcotics. Every ambulance comes equipped with a locked narcotics box, and the drugs are limited to administration by paramedics and EMT critical cares, a level only slightly below that of paramedic. Harpur’s Ferry has two ambulances, one of which is always designated as the primary response unit for a shift, and the other a secondary response unit. Before going out, each ambulance goes through a rig check, in which volunteers go through everything stocked in the ambulance, making sure they have everything they need for a call. Harpur’s Ferry also owns two SUVs they call Flycars, which come equipped with many of the same medical supplies as the ambulances, but the Flycars are specifically used for providing additional aid at a scene rather than transporting patients. Though many Harpur’s Ferry volunteers are current BU students, many community members and Binghamton alumni work with the organization. ‘Ten to 15 percent of our membership are community members,’ Cisne said. As part of the East Campus Housing Project, Harpur’s Ferry will be receiving a new squad room. According to Robbie Cohen, a junior double-majoring in political science and history and Harpur’s Ferry deputy director and first assistant chief, they’re getting ready to begin the transition next semester and expect to be moved in fully over the summer. Though Harpur’s Ferry serves mostly the BU campus, it sometimes responds to calls in the local community, depending on need and the availability of other local emergency medical services. When a patient is picked up by Harpur’s Ferry, they are usually taken to one of three local hospitals. Wilson’s is reserved for trauma cases, Lourdes is common for general illness and Binghamton General is where most intoxication cases are brought. While in transport, Harpur’s Ferry crew members follow standard procedures to help the patient. They ask for medical history, put the patient on oxygen if necessary, take vitals and talk with the patient to keep him or her as calm as possible. If anyone is ever in need of medical attention, Harpur’s Ferry is only a call away at (607) 777-3333.